Tennis Canada announced Wednesday the list of players who will participate in the Granby National Bank Challenger. The tournament features a mixed draw, with the men competing in the $100,000 ATP Challenger event and the women competing in the $60,000 ITF Challenger event. The tournament will be held from July 21 to 29 at the Club de tennis des loisirs de Granby. Peter Polansky (Thornhill, ON), Filip Peliwo (Vancouver, BC), Brayden Schnur (Pickering, ON) and Frank Dancevic (Niagara Falls, ON) will be competing in the men’s main draw. Currently ranked a career-high no. 110, Polansky is on the verge of breaking into the Top 100 for the first time in his career after reaching the first round of the first three Grand Slams of the year. He was a finalist at the Granby Challenger last year, also reaching the finals in Winnipeg and Gatineau. Peliwo and Schnur both have long histories on the Canadian tournament circuit, having played in Granby a total of five and eight times, respectively. Last year, Schnur reached the semi-finals whereas Peliwo fell in the first round. Dancevic will round out the Canadian contingent in the main draw on the men’s side. The two-time champion (2006 and 2013) will be looking to avenge his first round losses from the past three years. In the women’s draw, Carol Zhao (Richmond Hill, ON) will be returning to Granby as the No. 1 ranked Canadian player on the WTA tour. Currently ranked a career-high no. 131, she is slated to be the tournament’s second seed. Despite losing in the first round in singles last year, she took home the doubles crown in Granby for the second time. She was also crowned doubles champion in 2013. Zhao won the biggest title of her young career in 2017 at the $100,000 Shenzhen Challenger in China. She will be joined in the main draw by 18-year-old Bianca Andreescu (Mississauga, ON). The Ontario native had a stellar 2017 season which saw her capture two junior Grand Slam titles, two ITF Pro Circuit singles titles as well as the doubles title at the Saguenay Challenger. 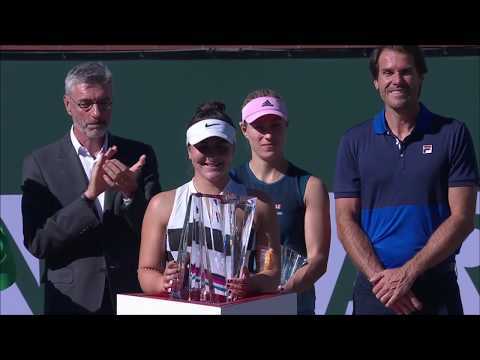 Andreescu was named WTA Breakthrough of the Month for July, following her deep run to the quarter-finals of the WTA tournament in Washington. She fell in the first round to compatriot Katherine Sebov (Toronto, ON) in the second round in Granby last summer. For her part, Sebov will be looking to go even further in 2018, she who reached the finals last year. On the international front, Granby will welcome one Top 100 players and 13 Top 200 players in both the men and women’s draws. The tournament’s top seed in the men’s draw will be Frenchman Pierre-Hugues Herbert, who is currently ranked no. 72 on the ATP World Tour. A proficient doubles player, he has won the titles at the US Open (2015), Wimbledon (2016) and the French Open (2018) playing alongside compatriot Nicolas Mahut. Fans will also recognize the 2015 champion in Granby and a mainstay on the Quebec tournament circuit, Vincent Millot of France. The women’s side will also see the return of a few former champions, as Risa Osaki (2013) and Cristiana Ferrando (2017) are currently set to compete in the main draw. The tournament’s top seed among the women is world no. 121 Arina Rodionova of Australia. The Granby National Bank Challenger is the second of two mixed draw tournaments held in Quebec during the month of July. The tournament was proceeded by the Gatineau National Bank Challenger.